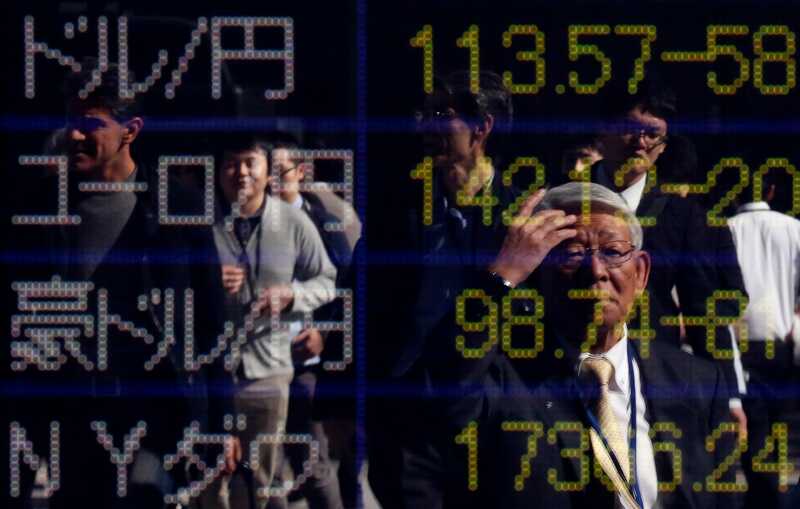 ReutersA pedestrian scratching his face is reflected on an electronic board showing exchange rates between (from top row to third row) the Japanese yen against the U.S. dollar, the euro, and Australian dollar, and market indices of Dow Jones outside a brokerage in Tokyo November 4, 2014. Sweeping Republican party wins in U.S. mid-term elections pushed the dollar to a seven-year high against the yen and lifted U.S. stock futures on Wednesday, as more soft data from China left oil at its lowest in four years. Republicans rode a wave of voter discontent to secure control of the U.S. Senate and strengthen their grip on the House of Representatives in a punishing blow to President Barack Obama that will limit his power in his last two years in office. For financial markets, the likelihood that that will curb the legislative agenda, or alternatively ensure a greater incentive for comprise between the two sides, was seen as positive. Similar situations in the past have often sparked U.S. stock market rallies. Early futures prices pointed to a 0.3 to 0.4 per cent gain for Wall Street when trading opens, while the dollar rose to as high as 114.59 yen, its highest level since December 2007. “We all saw this result coming but the main thing is what the two sides decide, whether they want to co-operate and compromise (on policy) or whether they are going to go back to the trenches,” said Philip Marey a U.S.-focused economist at Rabobank. Europe’s main stock markets were also on the front foot, rising 0.5-0.9 per cent as some encouraging company earnings from Britain to Sweden helped the region shake off the downbeat Chinese purchasing managers’ survey that had dominated Asian trading. Growth in China’s services sector weakened further in October as new business cooled, reinforcing signs of a gradual economic slowdown that could prod the government to unveil fresh stimulus measures. MSCI’s broadest index of Asia-Pacific shares outside Japan dropped 0.5 per cent, although Tokyo rose as the yen continued to weaken. For commodities, the China data was the latest blow to the ribs. Brent oil fell towards $US80 a barrel as demand worries mounted. Growth-attuned metal copper hit its lowest in a fortnight and gold slid for a fifth session in six, tumbling to a four-year low below $US1,150 an ounce as a strong dollar kept investors away. “The market is already soft for Brent and the Chinese data is not going to help although the numbers are not a surprise,” said Avtar Sandu, senior manager for commodities at Phillip Futures of the Chinese data. It wasn’t only China that was spluttering. Euro zone data showed business growth picked up less than expected in October despite much deeper price cutting from firms. Retail sales were also weak and even high-flying neighbour Britain saw its dominant services sector slow. That meant the euro’s struggles continued a day ahead of the European Central Bank’s monthly meeting. It hit a two-year low against the Swiss franc and slid back below $US1.25 against the dollar as sterling also wilted. REUTERS/Ralph OrlowskiEuropean Central Bank (ECB) President Mario Draghi speaks during the bank’s monthly news conference in Frankfurt August 7, 2014. 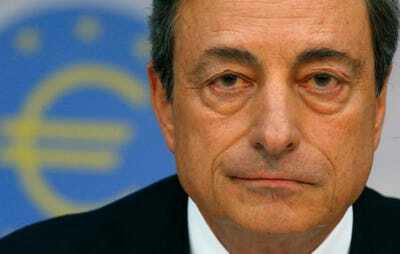 As well as bets that feeble euro zone growth and inflation will prompt more action from the ECB in the coming months, sentiment on the shared currency remained uncertain following a Reuters story saying ECB President Mario Draghi’s leadership style was upsetting some of the national central banks. “We do not expect further easing at Thursday’s ECB meeting but it may give more insight into its new asset purchase programmes,” strategists at Barclays said. The dollar was last buying 114.47 yen, up 0.7 per cent at a fresh seven-year peak. The euro was worth just under $US1.25. The safe-haven appeal of U.S. Treasury notes left the benchmark 10-year yield hovering at 2.344 per cent ahead of U.S. trading, while German and other European bond markets were largely quiet ahead of the ECB meeting. Russia’s rouble hit a new all-time low as the country’s central bank finally succumbed to this year’s heavy pressure on the currency that has cost it almost $US75 billion in reserves. A big rate hike last week had failed to ease the strains so the central bank said on Wednesday it would massively scale down its currency market intervention, meaning the rouble’s level will now largely be determined by the market. The continuing drop in the price of oil, which is Russia’s biggest revenue earner, remained the big pressure but signs of tensions flaring again in Ukraine added to the strains. Separatist leaders in east Ukraine accused President Petro Poroshenko of violating a peace deal by suspending a law giving their regions a “special status”. Russia meanwhile test-fired an intercontinental missile from a submarine in the Barents Sea a day after both Moscow and Kiev had moved troops closer to their joint border.